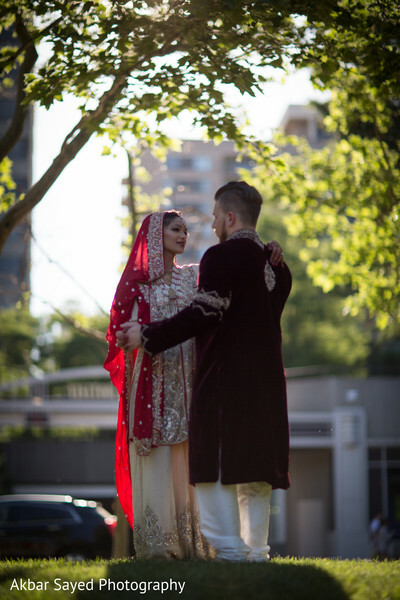 Akbar Sayed Photography shares with us a spectacular Pakistani fusion wedding from Springfield, Virginia! We are kicking things off with the big bridal unveil which happens during the first look photo shoot! 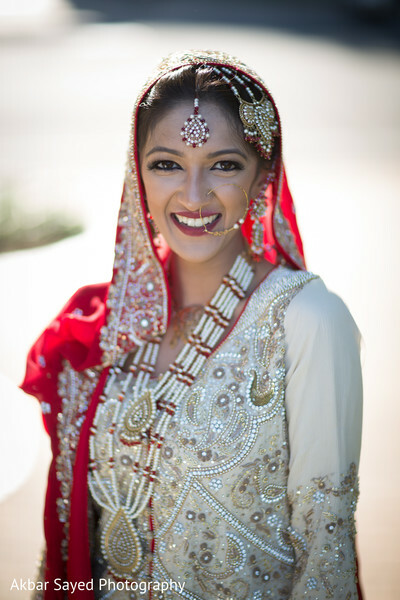 Maharani Anam is radiant in her open-shirt lengha, which she found at Mohsin in Pakistan! 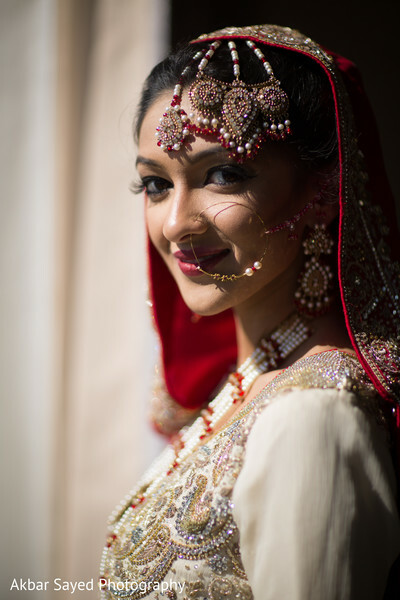 To beautify her look, hair and makeup extraordinaire Styles By Swati LLC. Lines Anam's upper and lower lids with jet black liner, and gives her lips a matte finish in ruby red! You can always count on long, fluttering lashes to add a bit of drama to the look! She is pretty as a picture draped in pearls! 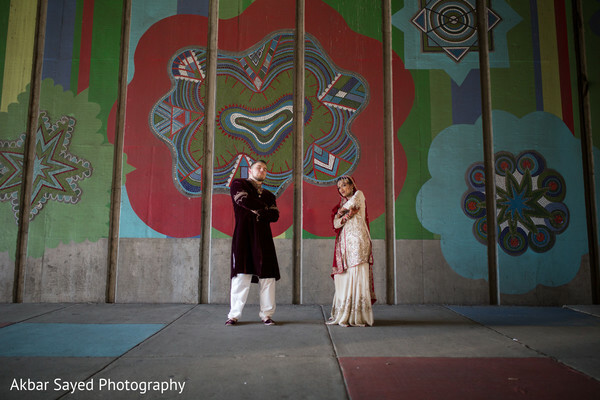 The handsome man by her side is the groom-to-be of course, who is styling and profiling in a dark burgundy sherwani! What a fashionable pair! 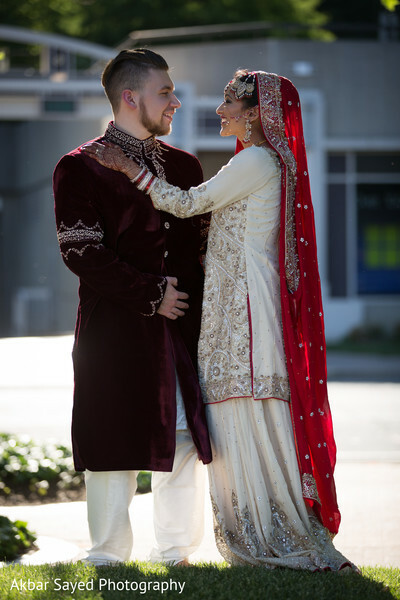 We've got more on the way including fabulous floral and decor by Imperial Décor, but while you wait, make sure to skip over to the gallery to see the colorful mehndi celebration! 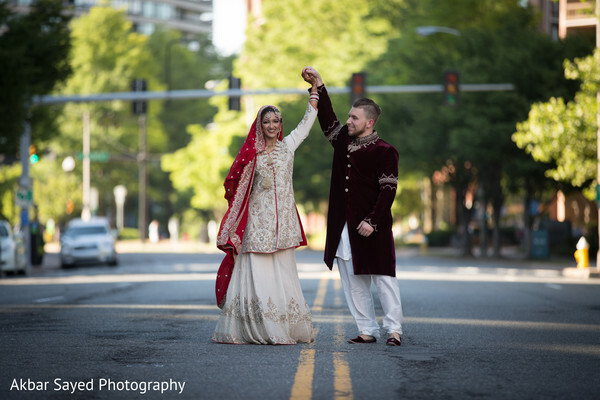 "We met in an Accounting class at George Mason University! We were seated next to each other and quickly became friends. I just remember him making me laugh uncontrollably the whole semester in class! He's so funny and goofy; he always puts a smile on my face! I knew he was the one when I introduced him to my family. He blended in so effortlessly, as if this was his family from the very beginning. It meant so much to me that he took to everyone so fast." "Our engagement was pretty formal; his parents were invited over for tea and to "talk" (lol). It was a very different experience for them. But despite the formality of it all he still managed to pull a few surprises. I had decided on the ring in advance and he ordered it without my knowledge. I came home one day after long day at work to a living room full of gifts surrounding a little box in the middle! The gifts were all things that I had been in dire need of for the past few weeks like hair bands and a new water bottle for the gym. He's always been so intuitive, it was just cute to know that he noticed these small things about me. And of course, the ring was beautiful! It was such a fun surprise." 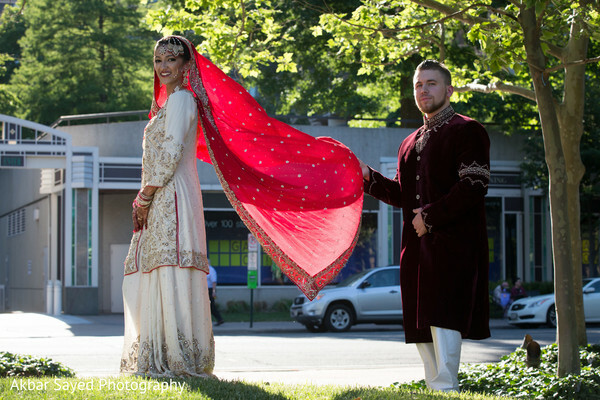 "I went to Pakistan to design my lengha from the same place where my mom bought hers 27 years ago! The shop owner remembered her and was excited to be designing my dress. I did spend quite a bit of time looking online but the selection in Pakistan is unlike any other. I ended up taking bits and pieces from 8 different dresses (some online and some that I saw in the store) to come up with mine. My designer was so amenable and easy to work with. I went to Mohsin, a small dress shop in Pakistan." "One of the most fun parts of wedding shopping was the jewelry! I designed my own jewelry in Pakistan (the rani necklace, tikka, jhoomar, and earrings). The smaller gold necklace I wore was my grandmother's necklace that she wore at her wedding and my nuth (nose ring) was my aunt's who wore it at her wedding! I felt so close and connected to my family." The ceremony shots are right around the corner!